Size of this preview: 754 × 600 pixels. Other resolutions: 302 × 240 pixels | 2,664 × 2,119 pixels. 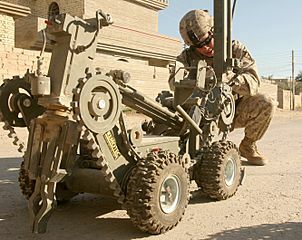 Description: IED DETONATOR — A U.S. Marine Corps explosive ordnance disposal technician prepares to deploy a device that will detonate a buried improvised explosive device near Camp Fallujah, Iraq, Nov. 27, 2005. The Marine is assigned to Combat Logistics Brigade 8, 2nd Marine Logistics Group. U. S. Marine Corps photo by Lance Cpl. Bobby J. Segovia. Credit: U.S. Dept. of Defense here. This page was last modified on 21 April 2017, at 01:26.